Sri City, January 23, 2019: – M/s THK India Pvt. Ltd., a subsidiary of THK CO., Ltd., a Japanese major engaged in manufacture of linear motion guides and equipment for transport vehicles, held groundbreaking ceremony in Sri City on Wednesday, marking the start of construction of its maiden production unit in the country. 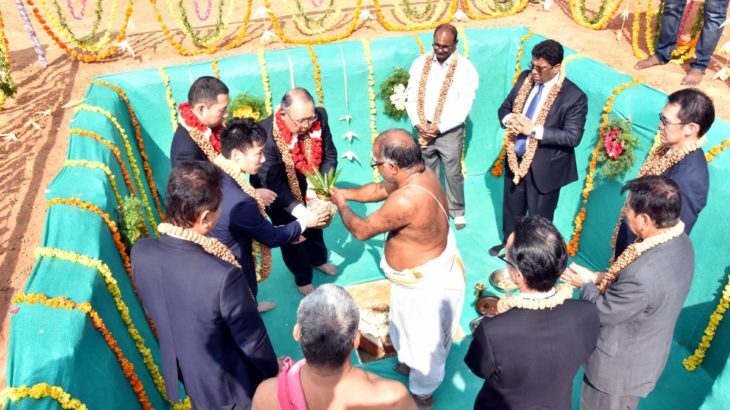 Mr. Akihiro Teramachi, President & CEO, THK Group performed foundation laying ceremony in the presence of Mr. Ravindra Sannareddy, Founder Managing Director, Sri City, Mr. V. Ramakrishna Reddy, Dy. Chief Inspector of Factories, Govt., of AP, Mr. Takashi Teramachi, Director, THK Group, Mr. Nozomi Kamada, Project Head, THK India Pvt. Ltd., and a host of senior managers of THK Group. Stating that among the various sites surveyed by them ‘Sri City was the best’, Mr. Akihiro Teramachi said,”It has excellent infrastructure, stable power supply and water, and above all, a trustable management team. I feel it as a great honour to kickstart the construction works for our first plant in India. Since our products are widely used components across various industries, we are sure, our technology will contribute to build an affluent society in India. It is definitely a great step and a challenge for THK to start manufacturing in India. We strongly hope, we would grow up together with India’s market.” ”We look forward to work hand-in-hand with Sri City and AP government,” he added. He assured all support from Sri City and wished them all success. The plant, which will be built in a plot of 50 acre in the Domestic Tariff Zone (DTZ) at an initial investment of around Rs. 500 crores, will be commissioned by January 2020. The project that will manufacture linear motion guides for industrial equipment and transportation vehicles, would generate direct/indirect employment for about 400 people. It may be recalled that Akihiro Teramachi and Mr. J Krishna Kishore, chief executive officer, APEDB had signed a memorandum of understanding, in the presence of AP Chief Minister N Chandrababu Naidu, in March 2018.